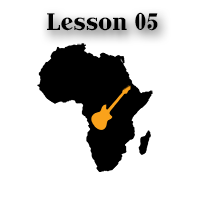 Another guitar tutorial on the West African style, but with the melody line on top this time. Unlike the previous fingerstyle piece where the melody was in the bass, this one has a more obvious major tonality. In fact, the example is harmonized with the I. and ii. degree chords. It also has a clearly recognizable shuffle feel, but with an interesting placement of the rhythmical accents. If you are confused by this at first, just follow the TAB. It will help you not getting confused (you can get it below). The difference from the previous lesson is not only the melody in the high voice, but the overall tune being played up high on the fretboard. It’s of course easier to accomplish on an electric guitar, or even an acoustic with a cutaway. If you run into trouble in the form of a full body guitar, I suggest you to transpose the song a bit lower. Still, you may have already noticed that playing high up on the neck is not at all unusual. Quite the opposite; it’s a characteristic of African guitar music. Note that the bass line is quite softer and sparser than in lesson 04. There’s even a part where the melody advances completely unaccompanied. At that part it’s basically a sequence of playing the chords first, then the melody line separately, one after the other. 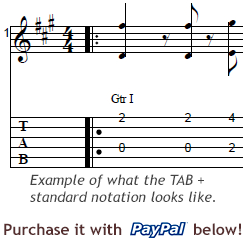 In the second part of the piece, it becomes pretty much what’s commonly called chord melody playing style. Make sure that you practice it slowly, so the pinky-fretted notes come out clean and accurate.